Exceptional resolution at both low and high frequencies Three time-interval modes solve more problems Flexible signal conditioning optimized for both frequency and time-interval measurements Selectable gate time from 60 ms to 10 s 100 MHz A and B input channels, Optional 1 GHz C channel Full frequency range (to 100 MHz) on both input channels Proven reliability and excellent RFI protection Exceptional Resolution Below 10 MHz, the counter measures the input signal period, then computes and displays the reciprocal frequency with 7 digits of resolution in one second for signals as low as 0.1 Hz. 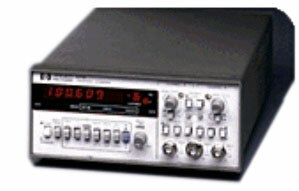 Above 10 MHz, the counter automatically performs as a conventional counter. Three Modes The HP 5316B offers 100 ns single-shot time-interval resolution. Time-interval averaging boosts performance to 10 ps resolution. A time-interval delay ignores spurious signals that would normally cause the counter to trigger. Flexible Conditioning Choose ac or dc coupling, a sensitivity control (variable attenuator), and a switchable low-pass filter. Both channels have trigger level controls with easy setting.